Was I going bananas over banana cakes or wat? Hmm .. not really, it was just that I had some ripe bananas at home. Mum in law had even made banana fritters and still I had balance so wat else?? 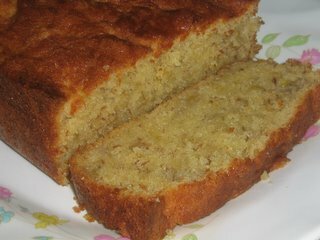 I baked yet another banana cake .. hehehe. Some readers actually requested verbally and via email that I share my tried and tested recipes. So from this month on, I will try to do so. So this is going to be the first one yah .. Banana Cake recipe. Grease a loaf tin with softened butter. Pour eggs in a little at a time, beating well in between additions. Using a metal spoon, fold in half the flour and bicarbonate of soda. Quickly mash the bananas, then fold it in the mixture. Finally, fold in the rest of the flour. Turn the mixture into the greased tin and bake for 40 mins or until cooked lah.